In the past few weeks we have looked a methods of trying to track a significant change in the level of support for the main parties in the YouGov polls. Today we look at the use of EWMA Charts which are a form of statistical control used in engineering and other time series analysis. EWMA is an exponential weighted moving average technique which weights an ongoing series of observations and then checks whether the series over time breaches a defined distance from the original mean of the series. The best way to see it’s use is to show a practical example. 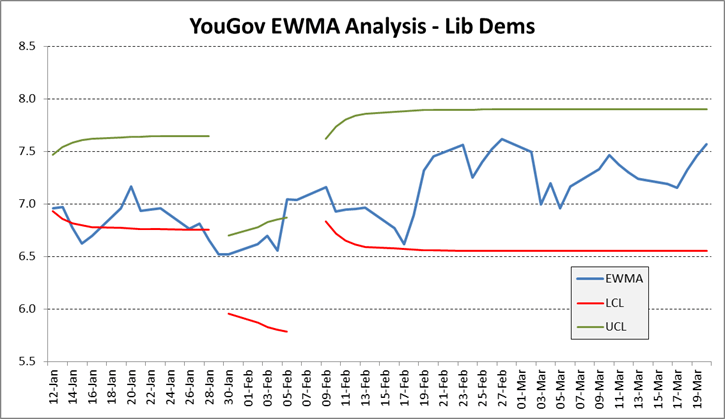 In our analysis on all YouGov polling since the start of the year we have used a λ of 0.2 (in line with most standard thinking on the usage of EWMA) and an L of 2 ( roughly equivalent to looking for a breach of the bounds at 2 standard deviations from the mean.). We define Z0 as a five period arithmetic mean since the YouGov polling tends to be five out of every seven days, so five days is equivalent to the mean of the past week. A breach of the boundaries is defined as two consecutive values of the EWMA calculation above or below the relevant confidence line. The Conservative EWMA Chart is below. 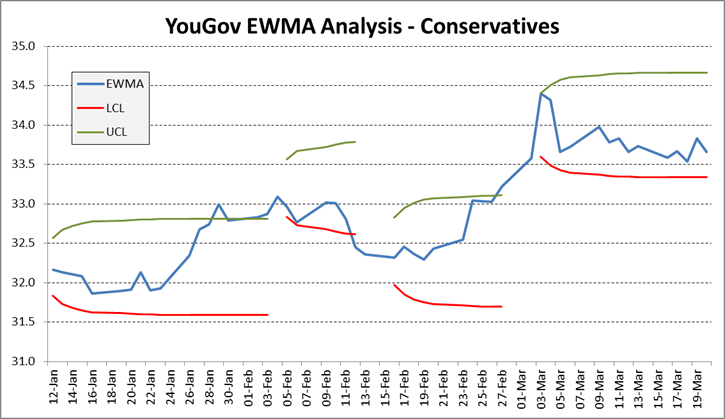 The initial mean of the Conservative vote is around 32.2 and the upper and lower bounds for the EWMA chart are shown in green and red. The mean of the Conservative vote moves up from around the 23rd of January and breaches the upper boundary around the 29th of January before dipping down below. There are two consecutive breaches by the 4th of February so the mean for Z0 is recalculated along with the confidence boundaries. The series drops down again a week later and then sees a dramatic shift up at the start of March. Since the new Z0 has been calculated there has been no breach of the boundaries. From this analysis we can identify three statistically significant movements in the support for the Conservatives since the start of the year – a move up at the start of February, a slight correction down a week later and then an even more significant move upwards at the start of March. At the time of writing we are observing a move downwards in the Conservative poll ratings, but not at a point yet where we believe a new level of average support is indicated. 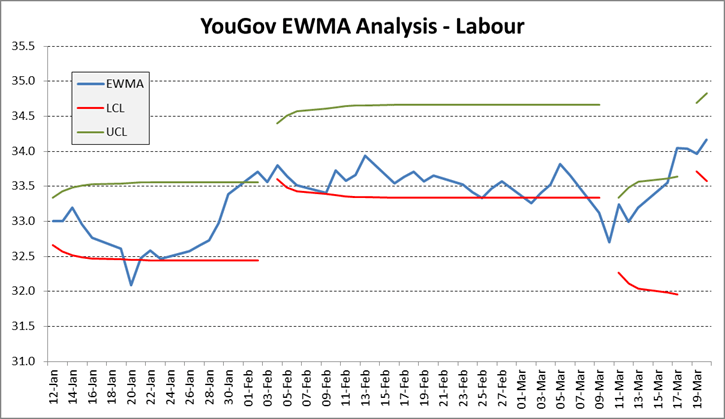 The Labour EWMA chart indicates an initial level of support around 33% which moved up to a new significant mean around 34% at the start of February. This moved back down to around 32.75% in the second week of March, but then rectifies itself mid-month to a new high for the mean around 34.25. The chart for the Liberal Democrats indicates a clear slump in support at the end of January which was recovered by the middle of February. There is currently movement towards the upper boundary of the current range. The UKIP chart shows a rise in support mid January which then slipped back at the start of February. Apart from a brief surge in support mid February which was corrected a few days later, poll ratings have moved around 14% since then. We are currently seeing a gradual decline in support and there is the possibility of the lower bound being breached by the end of the month. The overall picture is of a decline in UKIP support since the start of the year. The EWMA chart for the Green Party is the most dramatic of all our analysis. Starting with a mean of support around 7.25, the lower boundary is breached late February to a new mean around 6.25 and then a fortnight later the boundary is breached again to a new position around 5.75. 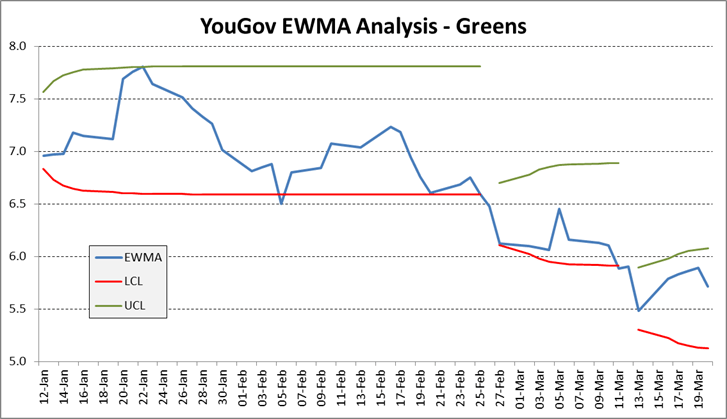 It is clear from this data that the “Green Surge” reported earlier this year is now rapidly diminishing. 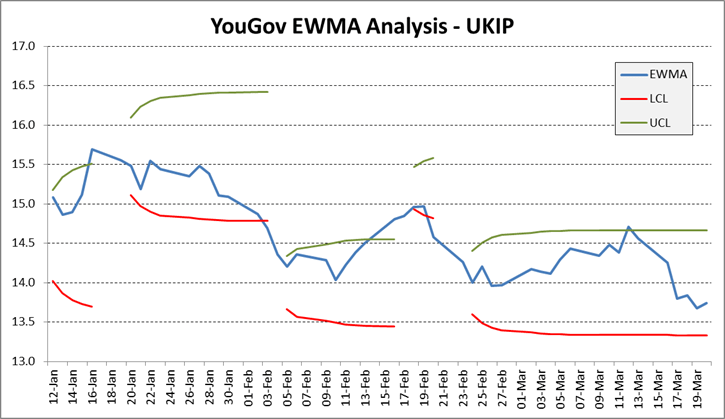 EWMA analysis is a great way of cutting through the variability in polls to provide some clear analysis of the movement in support for individual parties. It has the advantage of being a widely recognised statistical tool. Support for Labour currently runs at around 34%, an increase of 1% since the start of the year. We will continue to update our EWMA analysis and provide more insight over the next few weeks.